Medicare Supplement Plan A is generally the most affordable Medigap option available, but the price is reflected in the benefits offered. It is the least complete of all the supplemental insurance options, covering the bare minimum required by Medicare law. Continue reading to understand the benefits of a Medicare Supplement Plan A or call us 844-528-8688 for a personal consultation. In fact, federal regulations stipulate that any insurance provider who wishes to offer Medigap must offer Plan A. In this way, Plan A can be thought of as the most basic of Medicare supplemental insurance plans. When it comes to Medicare, terms can get confusing. Medigap Plan A is completely different from Medicare Part A.
Medicare Part A is one piece of your Original Medicare. It covers services such as hospital stays and skilled nursing facility care. Medigap Plan A is one of ten supplemental insurance plans that are meant to extend your Original Medicare benefits. It is optional and purchased separately from Medicare Part A. Who Is Medicare Supplement Plan A Best For? While it might not offer as much coverage as the other plans, Medigap Plan A is still a very nice addition to your Original Medicare. Remember that these are benefits you would not have if you stuck with just the traditional plan. Plan A, therefore, is ideal for anyone on a very strict budget who still wants to extend their Medicare benefits to avoid some of the most common and expensive out-of-pocket expenses. You’ll still need to meet your deductibles, but after that, your coinsurance and copayments for most services are completely covered. While most recipients are retirees age 65 or older, Medicare is also available to younger citizens who are diagnosed with certain disabilities or health conditions. While federal law doesn’t require private insurers to provide Medicare supplement plans to recipients under 65, most states states do have such a requirement (though the specific terms vary from state to state). 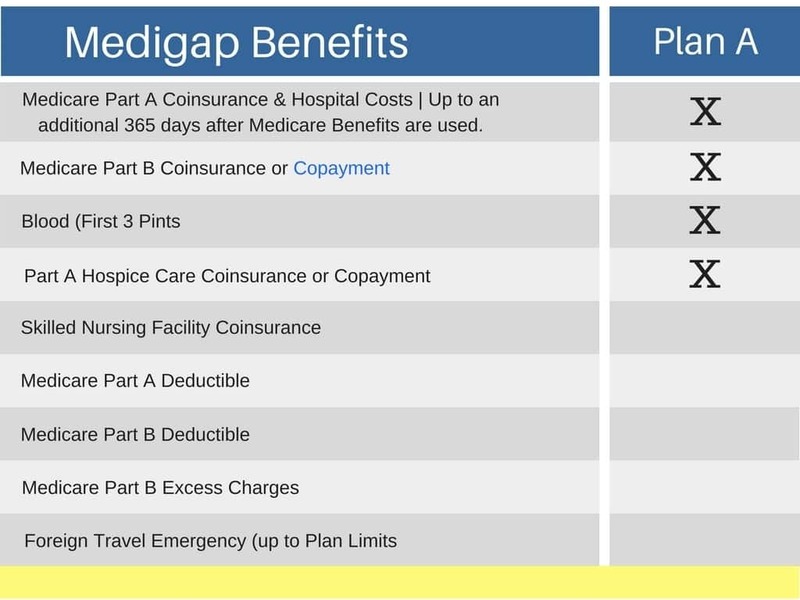 Because any company that sells Medigap must offer Plan A, it is the plan most commonly available to Medicare recipients under age 65. Ready to Enroll in Medicare Supplement Plan A?